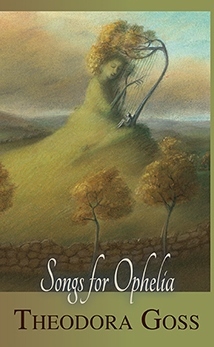 To call Theodora Goss’s book, Songs for Ophelia, a poetry book would not do justice to the stories that lie beyond the gossamer illustration gracing its cover. This is a collection of hauntingly beautiful stories some new, some old retold – a storybook for grownups. The term songs instead of poems suits this collection of prose stories. It puts one in mind of the bards of old, who with lyre in hand, sang their tales. In Songs for Ophelia, we accompany our own bard through enchanted realms, traversing the wheel of the year in the ancient way season by season, song by song. Strewn through this collection are songs populated by names out of legend and myth whose stories we thought we knew full well until we read Goss’s deft retelling. In her hands the stories are at once familiar and not. She adds a depth as she explores and exposes possibilities giving each character and place a richer more well-rounded existence on the page. Reviewing poetry is so very different from reviewing a novel, so I’ve chosen to give a small glimpse of one poem from each season of Goss’s enchanted collection. Ray Bradbury once told me to read good poetry or an essay before turning out the lights at night. He said he kept a good book or two of poetry or essays by his bed and read from one or the other volume every night. He said it turn the mind away from the noise and garbage of the day and prepared the mind for dream. Since that conversation, I’ve followed that ritual with various volumes – Gibran’s Sand and Foam, Leaves of Grass, and Rilke’s Book of Hours to name a few. Each brings its own brand of dreaming. I’m adding Songs for Ophelia to that short list, perhaps to walk enchanted realms in dream. Thank you Theodora Goss.